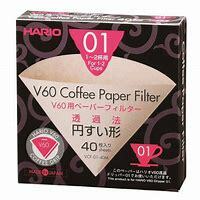 40 x Genuine Hario Filter papers to fit an 01 or 02 dripper. Please select the size you need below. Specifically manufactured to fit-in well into an 01 or 02 dripper. Designed to maximise extraction for a superior cup of coffee.